Contributions are welcomed on any subject which will interest our members around the world. 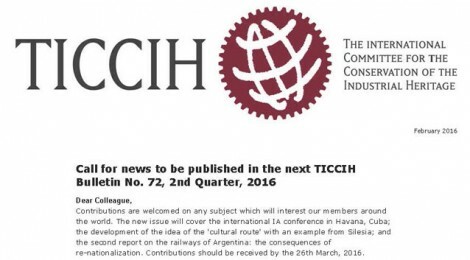 The new issue will cover the international IA conference in Havana, Cuba; the development of the idea of the ‘cultural route’ with an example from Silesia; and the second report on the railways of Argentina: the consequences of re-nationalization. Contributions should be received by the 26th March, 2016.